This proverb exists in different forms in many African languages. The basic meaning is that child upbringing is a communal effort. 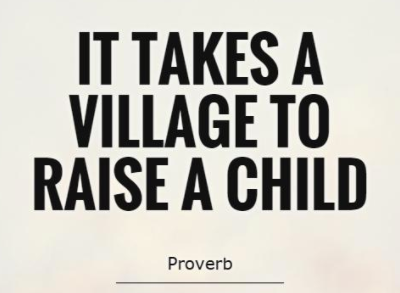 The responsibility for raising a child is shared with the larger family (sometimes called the extended family). Everyone in the family participates especially the older children, aunts and uncles, grandparents, and even cousins. ​Even the wider community gets involved such as neighbors and friends. Nobody is born with knowledge and experience. The unique ability to learn, interpret and apply knowledge has been the leading force of the human progress. Every day we are exposed to hundreds of simple and complex experiences and it is up to us which of those experiences to pick as valuable lessons. Some lessons we seek and even pay for, other will hit us from the blue and we won't be ready to respond to them. Keeping our minds open and staying hungry for new experiences tremendously widens our "Village" of sources to learn and increases our chance to make better lifestyle choices. Some people are trained to give lessons, others are born Teachers. We are ready by definition to learn from teachers, but we are also exposed to a great variety of interactions with regular people with every one with unique experiences and knowledges. Every person carrie lessons to past on and we just need to stay curious, listen and pick those that will make us better persons. Meet some of my Teachers, Trainers and important "villagers" that have influenced me with priceless lessons, inspiration and motivation.